"Next is Devices. Sales for the fiscal year are expected to be below the August forecast due to lower-than-expected sales of image sensors. 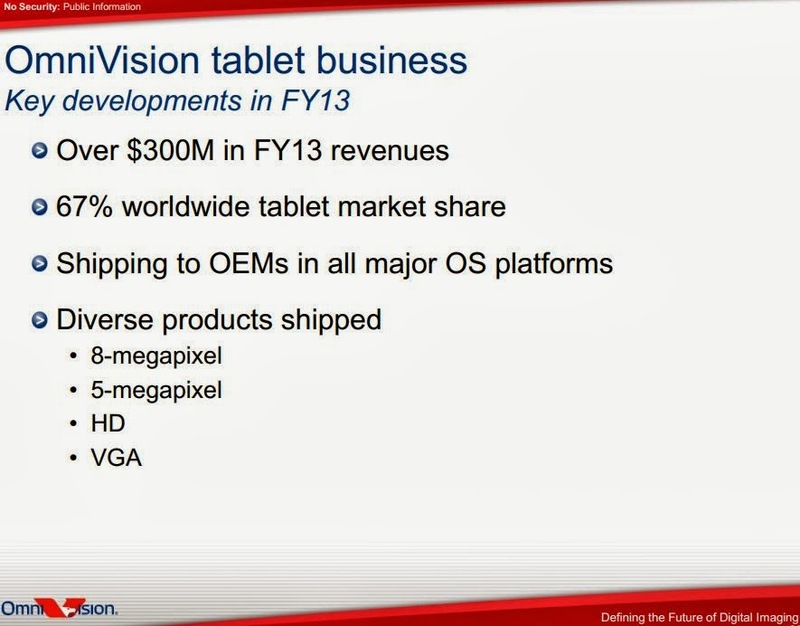 We also expect sales to decrease year-on-year. Operating income is expected to be below the August forecast due to the decrease in sales and we expect operating income to decrease significantly year-on-year." 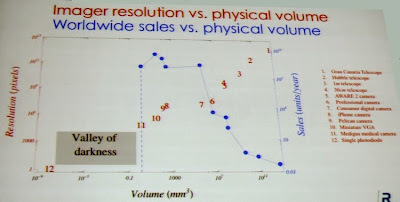 "And then second question on the weakness that you noted in image sensors, can you parse that between image sensors sold into the digital still camera market versus image sensors sold into the smartphone market. 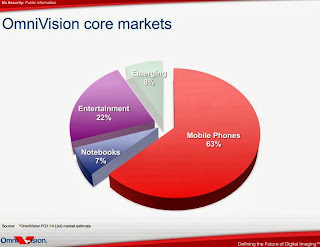 Are the 2 diverging i.e., DSC sales are going down but image sales to smartphones continues to be strong, or not?" "On the image sensor questions, yes, we have lowered somewhat the forecast for the semiconductor business. And in image sensors, what you said is correct in that it is mainly due to the decline in the digital still cameras. Now this is an industry-wide phenomenon. So since we have a very nice market share in this area, if the market goes down, our sales will be affected. On the smartphone side, this is still a growing market for us." "One follow-up on electronics -- on electronics, your semiconductor business, your Devices business is lower than forecast. You've sort of kept your CapEx in line. Any thought to adjusting your capital spending in that unit as the revenue forecasts come down?" "Okay. 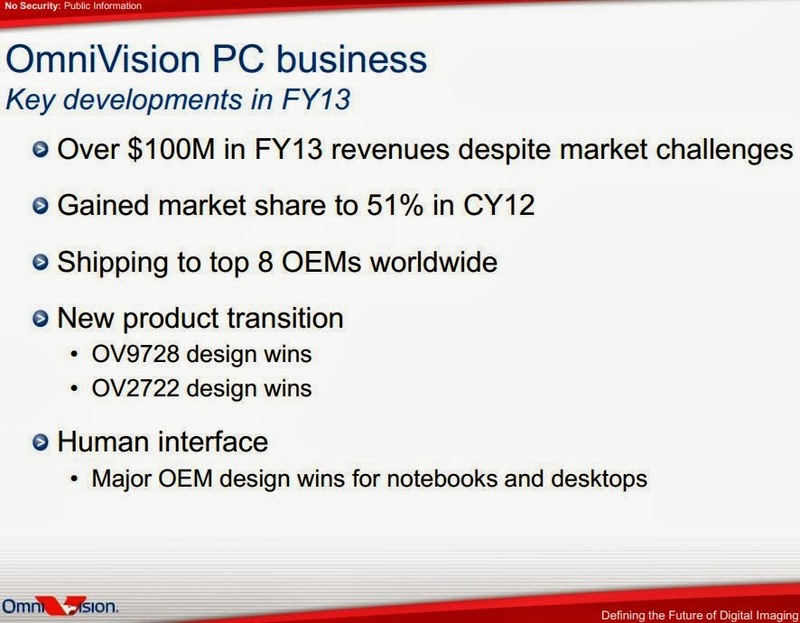 Now, we have -- in the semiconductor area, most of the CapEx is in image sensors. We do have other areas, such as logic, LSIs and gaming chipsets. But these areas do not carry big CapEx. And it is image sensors. Here in this image sensors, in the long term, we still see growth. But since we have already made a lot of investment, we do have the manufacturing base for growth in this area. 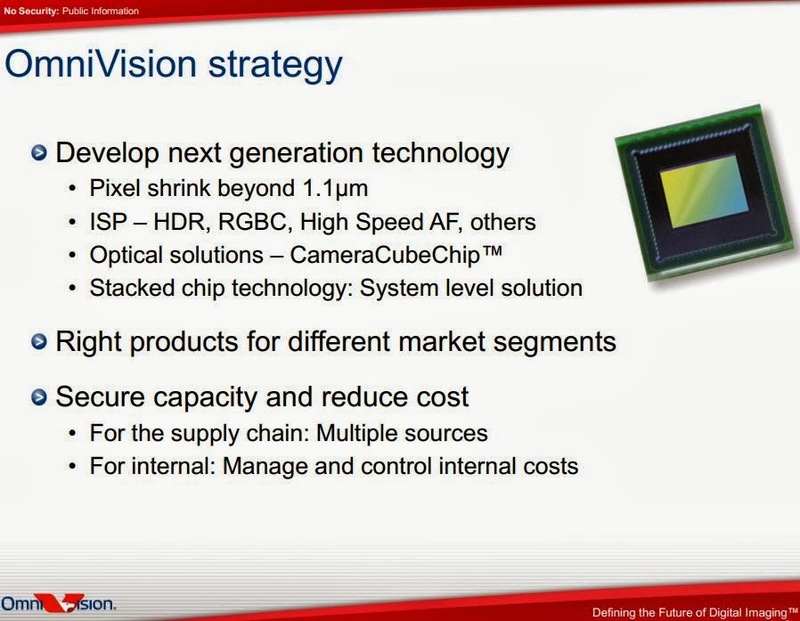 So yes, we will continue to invest in image sensors as necessary but it might not be in the kind of magnitude that we have been doing in the past several years." Tech-On: Dentsu ScienceJam developed a wearable camera that automatically takes a short video when the wearer becomes curious about something. 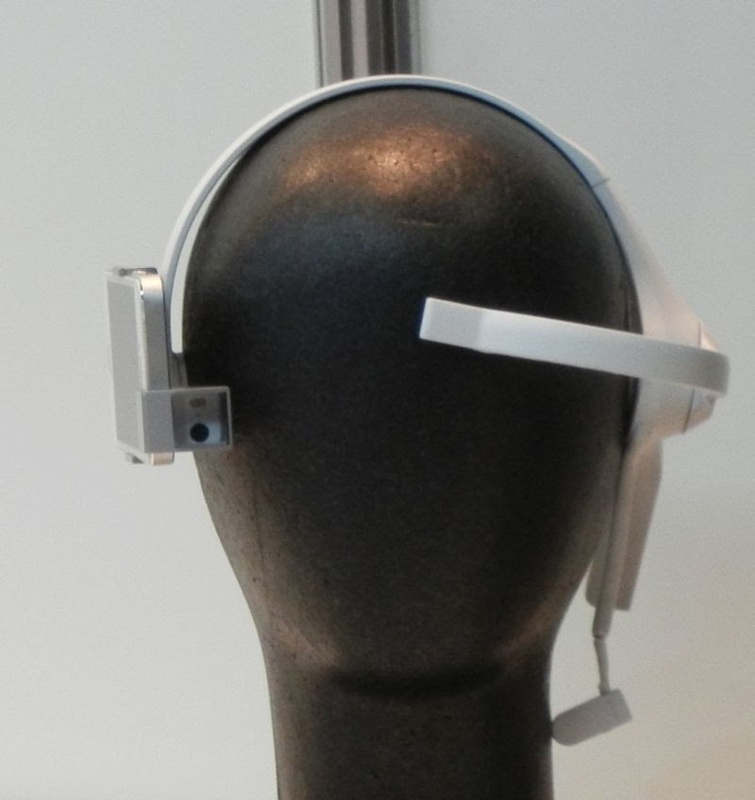 The camera, named "neurocam," has a "brain wave sensor" by NeuroSky Inc. And based on the brain activity measurement, the value of an index called "Curiosity Degree" is calculated. When the value exceeds a certain threshold, the camera automatically starts shooting a five-second video (GIF animation) and saves it. Renesas announces the development of video codec IP supporting HEVC/H.265 encoding and decoding. The new hardware IP supports up to 4K2K resolution (4096 × 2160) at a frame rate of 30fps or 2-channel Full HD 1080p at 60fps (one 1060p60 channel, according to other source). Data processing has been optimized to reduce the latency from the point at which data input starts to the point when the corresponding output starts to as little as 3 ms. Sales of the new IP are expected to start in November this year. PRNewswire: TI is introducing three new DaVinci video processors, the DM388, DMVA3 and DM383. DM388 is an enhanced version of the older DM385 processor for 1080p60 security camera. It adds 3D motion compensated noise reduction to ISP with H.264 encoder of the older chip. DMVA3 is a programmable vision coprocessor to run video analytics algorithms in security systems. DM383 is an image processor for the automotive dashboard cameras. Transparency Market Research is known by its controversial market reviews, such as US Image Sensor Market report. 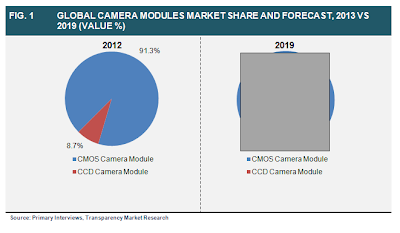 The new report is called "Global Camera Module Market - Industry Analysis, Size, Share, Growth, Trends, and Forecast, 2013- 2019." The global camera module market was worth $12.00B in 2012 and is expected to reach $43.06B in 2019, growing at a CAGR of 19.7% from 2013 to 2019. Asia Pacific was the largest market for camera modules in 2012 due to countries such as China, India, Taiwan, Korea, Japan and Singapore supporting their growth. North America was the second largest market. However, later in the PR Europe is called the second largest market for camera modules and is expected to see growth rate of 19.3 % from 2013 to 2019. Among different applications, smartphone and tablet PC sector is the largest and is expected to grow at the rate of 21.9% from 2013 to 2019, followed by consumer electronics (excluding smartphone and tablet PC) in 2012. The global shipments of camera modules in smartphones were about 80% of the global market in 2012. 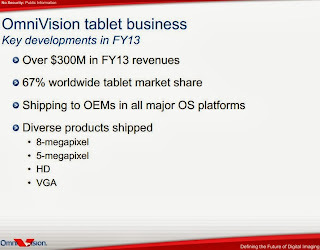 LG Innotek enjoys the maximum revenue share at present. Sony announces 4.1MP 1/1.8-inch CCDs for Industrial Cameras featuring the industry's smallest 3.1µm pixel with improved sensitivity and smear. The new ICX808ALA (B&W) and ICX808AQA (color) CCDs have 2-channel output and deliver 18fps at full resolution. The Electrical Engineer blog compares image quality of Nokia Lumia 1020 based on 1.1um pixels with Nikon D800e DSLR having 4.9um pixel size. As expected, D800 is better, but in many cases the images are quite comparable - amazing job on Nokia side. EETimes reports that Rumbus presented the world's smallest camera at Trillion Sensors Summit being held in Stanford University these days. So far Medigus and Awaiba made the smallest sensors for endoscopy. Medigus' 1mm2 imager is said to cost about $1,000. 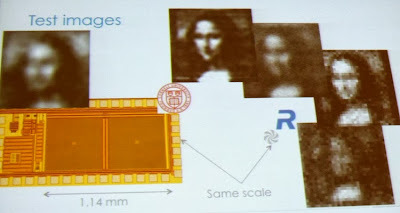 Rambus presented a lens-free camera that is said to be significantly cheaper and smaller than these tiniest imagers. The company created an 80um diffractive grating from which it was able to reconstruct a poor but visible image of the Mona Lisa. The technique requires significant computation to deliver even a blurry image, however the company sees an initial opportunity to enter the market as a thermal camera. The Mona Lisa picture required computation on the order of 350 million multiple-accumulates. Rambus got its first experimental results back in August and it aims to publish the results soon. Update: The presentation slides can be downloaded here. While Sony and Panasonic bet on 4K ecosystem to give a boost to their imaging businesses, Consumer Reports lab compares HD TV quality with the new 4K systems and finds the improvement is quite marginal: "As long as Ultra HD TVs command a premium price over comparably sized HD sets, it's hard to justify the extra expense, especially given the reality that UHD's advantages over regular HD will be lost in most typical home-viewing situations." Update: AFP publishes more details on Panasonic semiconductor rumors. There is also a new workshop confirmed "A Million Images per Second and Beyond" by Renato Turchetta, CMOS Sensor Design Group Leader at Rutherford Appleton Laboratory. (Another, earlier confirmed workshop is led by Albert Theuwissen). Started deliveries of a new high-value dedicated Image Signal Processor to a leading consumer brand. Sampled and demonstrated to automotive market leaders a new high-performance Image Signal Processor and image-sensor chipset with advanced features for automotive and security applications. Announced a new family of gyroscopes specifically optimized for image stabilization on mobile phones and cameras. "In ...areas such as the CIS, and we believe that -- and we already are seeing a very, very strong growth in the customer that we have, that they are becoming the dominant players in some of these mid to low-end CIS. And as they expand into the high-end market, I think they will be doing very well. So I think for us, our strategy is to pick the right customers and work with them, and serve them as they need." "Over the next few years we anticipate differentiated products such as CIS ...to transition to more advanced nodes." "For the CIS, actually we are actually at, you know, 0.13 and working on the 12-inch 65nm." "Okay. For your CIS clients, the 65nm process you talked about, that's for the domestic client or for the US client, foreigner client?" "We are actually having a lot of new clients working with us, so both domestic and overseas clients." "Uh-huh. I see. But in terms of the growth, it's mainly from the foreigner client, right? Is that right?" "In terms of the -- this year's growth? Are you talking about this year's growth?" "I'm talking about the next year growth." "I think that it could be both. It could be both, yeah." Business Wire: Edwin Roks, Teledyne-DALSA EVP and GM in Holland, is promoted to become the whole Teledyne CTO. Edwin has been in image sensor industry for a long time, starting from Philips Semiconductor, then joined DALSA when it acquired Philips image sensor business. Pentax DSLR Features "Anti-Aliasing Filter Simulator"
A newly announced Pentax K-3 DSLR features "the world’s first AA filter simulator, which reproduces the effects created by an optical AA filter. By applying microscopic vibrations to the CMOS sensor during exposure, the K-3 minimizes false color and moiré. You have a choice of three settings to obtain the desired effect: “TYPE 1” to attain the optimum balance between image resolution and moiré; “TYPE 2” to prioritize moiré compensation; and “OFF” to prioritize image resolution. Thanks to this innovative feature, the K-3 offers the benefits of two completely different cameras — the high-resolution images assured by an AA-filter-free model, and minimized false color and moiré assured by an AA-filter-equipped one. 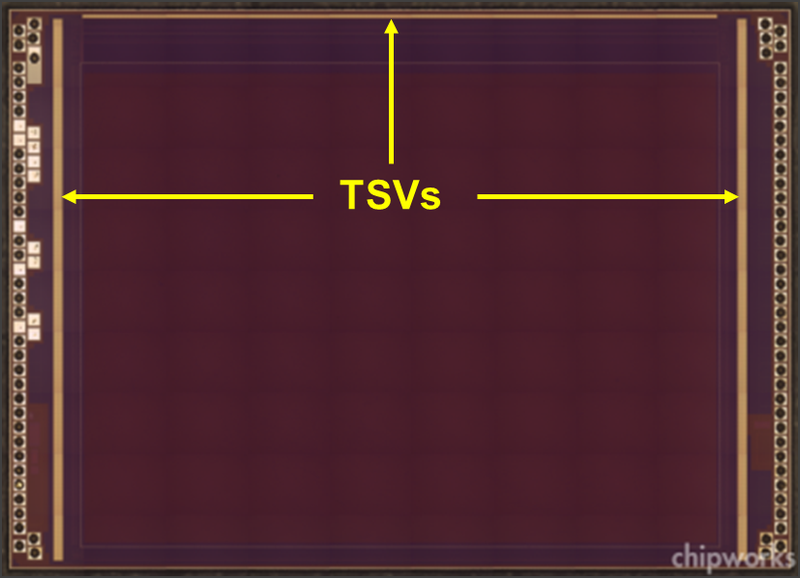 You can switch the AA filter effect on and off as you wish." 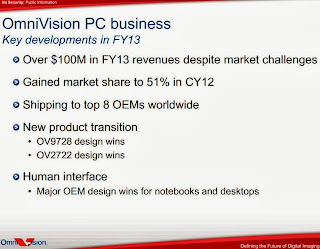 PRNewswire, EETimes: SMIC announces the formation of SMIC's Center for Vision, Sensors and 3DIC (CVS3D). CVS3D consolidates SMIC's R&D and manufacturing capabilities for silicon-based sensors, TSV and other middle-end wafer process (MEWP) technologies. MEWP technology has led to significant advancements in CMOS image sensors, 3D stacked devices, and high performance TSV-based 2.5D and 3D systems-in-package (SiP). The formation of CVS3D is a strategic step in SMIC's technology differentiation strategy as SMIC expands its technology offerings to a global customer base. One of SMIC customers is said to be already in production using CVS3D's technology offerings, a few customers have multiple additional products in qualification. EETimes published a nice story saying that when interpolating an image data, one needs to care not only about the interpolated data continuity, but also about the continuity of its first derivative. A discontinuity in the first derivative may create visible artifacts. The second derivative can be discontinuous, though. Korea IT News reports that Samsung LSI and Sony are competing for a primary sensor supplier status for a 16MP sensor in the oncoming Sansung Galaxy S5 phone. Sony used to have an absolute power on 13MP CIS for smartphones market. However, in the second half of this year, Samsung System LSI is said to be catching up with Sony at a high speed. Samsung is said to keep its existing suppliers for Galaxy S5 camera module, lens and AF actuator, while its System LSI Division and Sony are fiercely competing over a spot as a CIS main supplier. It is reported that Sony is currently proposing an exclusive distributorship contract for 16MP CIS for a set period of time with Samsung Electronics’ Wireless Business Division. Sony is said to focus solely on Samsung Electronics’ smartphones for its CIS business. Meanwhile, Samsung System LSI has started mass production of 8MP sensor for smartphones and is sampling 13MP and 16MP sensors. System LSI Division plans to increase 300mm CIS wafer input from 4,000 wafers a month to 8,000 in its Giheung Plant. With the increased production, a greater cost reduction effect is also anticipated. "We have no reason not to work with Sony or System LSI Division as long as they can prove their 16 million pixel CIS performance and mass-production capacities," explained an insider from Samsung Electronics’ Wireless Business Division. "Things will take shape around the year end because even a camera module sample test has not been completed yet." Update: Samsung Q3 2013 earnings report forecasts "high-pixel image sensor demand to increase" in Q4 2013. Post has been removed by IMEC's request. IMEC is still finalizing the video demo and would like to change some part of the content in the coming days. Another video at Qualcomm's site presents Arcsoft's NightHawk low-light video capture software that improves video in poor lighting conditions. "By only using the CPU, NightHawk would not be able to run in real time since the frame rate would be too low, not to mention that the power consumption would be too high. By using the CPU, GPU, DSP and ISP, ArcSoft claims that the NightHawk application is able to run in real time with more than 30% power savings." "Inspection systems are typically in use 24 hours per day with only short stoppages, the detectors are exposed to large doses of radiation after only a few months of operation. A photon with a vacuum wavelength of 250 nm has energy of approximately 5 eV. 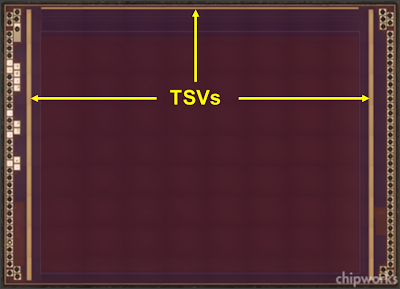 The bandgap of silicon dioxide is about 10 eV. Although it would appear that such wavelength photons cannot be absorbed by silicon dioxide, silicon dioxide as grown on a silicon surface must have some dangling bonds at the interface with the silicon because the silicon dioxide structure cannot perfectly match that of the silicon crystal. Furthermore, because the single dioxide is amorphous, there are likely also some dangling bonds within the material. In practice, there will be a non-negligible density of defects and impurities within the oxide, as well as at the interface to underlying semiconductor, that can absorb photons with deep UV wavelengths, particularly those shorter than about 250 nm in wavelength. Furthermore, under high radiation flux density, two high-energy photons may arrive near the same location within a very short time interval (nanoseconds or picoseconds), which can lead to electrons being excited to the conduction band of the silicon dioxide by two absorption events in rapid succession or by two-photon absorption. EUV photons have very high energies (13.5 nm in wavelength corresponds to photon energy close to 92 eV) and are capable of breaking silicon-oxygen bonds as well as strongly interacting with defects and contaminants in the oxide. Electron and charged-particle detectors typically have to detect electrons or charged particles with energies of a few hundred eV or higher. Energies greater than 10 eV can readily break silicon-oxygen bonds. As indicated above, high-energy photons and particles can break bonds and ionize atoms in a silicon dioxide layer. Because silicon dioxide is a good insulator, free electrons created in the silicon dioxide may have lifetimes of ms or longer before recombining. Some of these electrons may migrate into the semiconductor material. These electrons create electric fields within the silicon dioxide and between the silicon dioxide and semiconductor. These electric fields can cause electrons created in the semiconductor by absorption of photons to migrate to the surface of the semiconductor and recombine, thereby resulting in lost signal and reduced detector quantum efficiency. Near continuous use of the instrument means that there may be little, or no, time for recovery of the detector, as new free charges are created as fast as, or faster than, they can recombine. High-energy particles and photons can also cause irreversible changes to the silicon dioxide. Such changes can include reconfiguration of the bonding of atoms or migration of small atoms within the silicon dioxide. At normal operating temperatures of the detector, which are typically in a range from around room temperature to about 50° C., these changes will not recover. In particular, it is known that conventional silicon photodiodes used as EUV detectors degrade in efficiency with use. 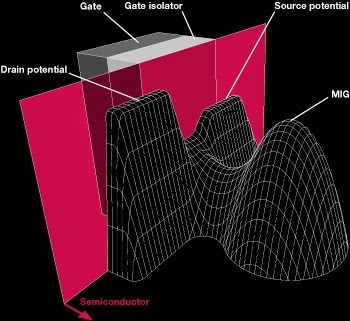 The silicon dioxide layer on the surface of semiconductor detectors significantly reduces the efficiency of those detectors for low-energy (less than about 2 kV) electrons. Some low-energy electrons are absorbed by the silicon dioxide, thereby causing the silicon dioxide to charge up and deflect subsequent arriving electrons. Because a native oxide will always form on an exposed silicon surface, silicon detectors necessarily must have some oxide on their surface. Growing or depositing an alternative dielectric material (instead of the oxide) on the surface of the semiconductor results in a much higher density of defect states at the semiconductor to silicon dioxide interface. These defects reduce the quantum efficiency of the detector, especially for photons or charged particles absorbed close to the surface of the semiconductor." "Daala is a new general-purpose video codec currently under development at Xiph.Org. 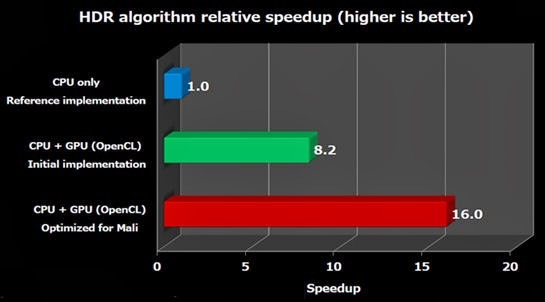 Our performance target is roughly a generation beyond current 'next-generation' codecs like VP9 and HEVC, making Daala a next-next-generation effort. As with other Xiph codecs, the Daala format is and will always be royalty-free with a permissive FOSS license. On May 30th 2013, our in-development Daala prototype encoded and decoded its first streams. Two hours later, Mozilla's David "oneman" Richards streamed the first live Daala video over the Internet." 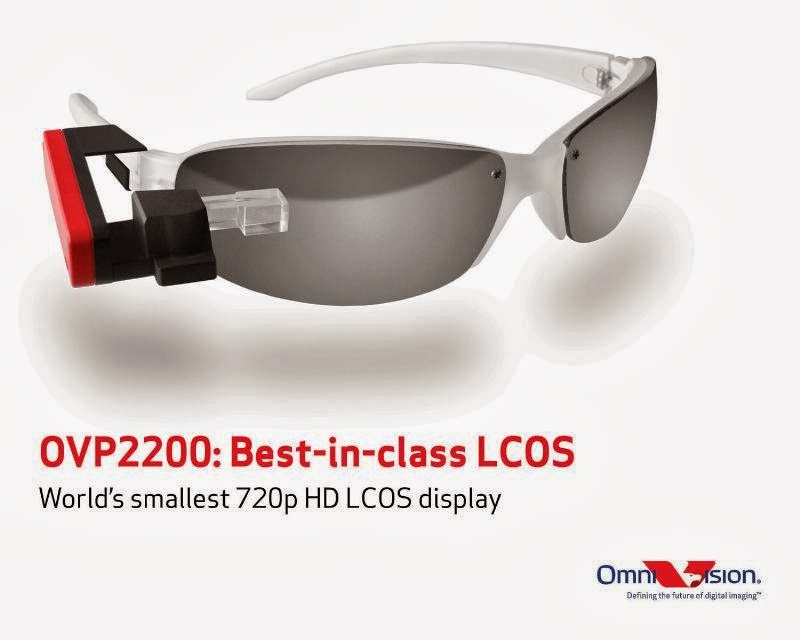 PR Newswire: Omnivision announces OmniGlass reference design that combines a wearable display and a camera module: an ultra-compact and low-power OVP2200 liquid crystal on silicon (LCOS) solution, a 4MP AF camera module with 720p HD video, and the OVP921, a companion chip that provides image processing, Bluetooth, and Wi-Fi support. A prototype of OmniGlass is currently available for demonstrations, and a development kit is available for customer sampling upon request. The OVP2200 is currently sampling, with volume production expected to begin during Q2 2014. The article goes through the Ion Torrent genome sequencing machine generations, and talks about the recent developments of the company's pH-sensor. The pH-pixel size has shrunk down to 1.25um now and continues shrinking, while resolution went up to 13MP. The price of full human genome sequencing is expected to drop to $1000 in 2014, in part due to the higher resolution pH-sensor chips: 660MP Ion PII and 1.2GP Ion PIII. Nobukazu Teranishi won 2013 IEEE Electron Device Society J.J. Ebers Award "For development of the Pinned Photodiode concept widely used in Image Sensors". Congratulations, Nobu-san! R. Zhang, L. Bie, T.-C.Fung*, J. Kanicki, University of Michigan, *Qualcomm MEMS Technologies, Inc.
"In this paper, for the first time, we report on high performance a-IGZO TFTs based passive pixel sensor (PPS) and active pixel sensor (APS) circuits. Experimental results show that single-TFT PPS with a pitch length of 50µm achieved a signal charge gain approaching to unity (Gain=0.93) under a fast readout time of 20µs and a dynamic range of 40dB. APS based on three a-IGZO TFTs established a high dynamic range, which is more than 60dB. In addition, 2-TFTs half active pixel sensor (H-APS) testing circuits are also used to investigate the voltage gain properties for APS in this work." "We present three-dimensional structures, vertical transfer gate and buried shielding metal that can be applied to our latest 1/2.3” 1.20um 20M pixels back-illuminated CMOS image sensor. 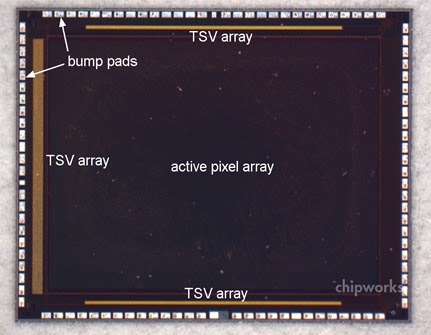 New pixel design and process exhibited 60% higher saturation signals and 50% lower crosstalk without any degradation in white blemish and dark current." Reuters: MIPI Alliance announces the availability of new version of its M-PHY specification. The M-PHY 3.0 doubles the current bandwidth (to 6.0Gbps per lane) while retaining the same distance reach as its predecessor. It also maintains the MIPI Alliance mobile priorities of low power, minimal protocol impact (modularity), and fast transitions between power states. Update: PrivateEquity.com reports that Samsung's new investment fund is expected to invest in activities that touch on those of Samsung R&D center in Israel, which deals with the development of mobile hardware technology and hardware components for cameras. 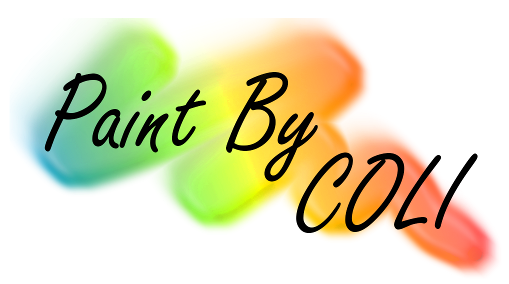 Petapixel, Phys.org: University of Exeter, UK students present a project called "Paint By COLI". The team attempt to modify E.coli bacteria with light sensitive and pigment production genes, in order to produce a full color biocamera. Bio-Photography is the application of genetically engineered bacteria to act as the light sensor of a camera, replacing digital sensors or photographic film. The surface area of bacteria is on the order of microns, so the resolution should be quite competitive with the current cameras. Individual bacteria functions would be geared for certain wavelengths — red light would stimulate production of cyan pigment, green light for magenta pigment and blue light for yellow. The project is currently supported by The University of Exeter Annual Fund, CLES, CEMPS and academics from across the University. The group is going to present the project at the Genetically Engineered Machines (iGEM) event in Lyon, France on Oct. 11-13. Microsoft Research posted its paper from CHI'12 conference "Shake’n’Sense: Reducing Interference for Overlapping Structured Light Depth Cameras" by Alex Butler, Shahram Izadi, Otmar Hilliges, David Molyneaux, Steve Hodges, and David Kim. "The key behind Shake‟n‟Sense is to minimally vibrate a Kinect camera unit using an offset-weight vibration motor and thereby artificially introduce motion blur. Both the structured light DOE illuminator and the IR camera of the Kinect will move in harmony, which means that depth sensing works as normal, albeit with a little induced blur. However, even minor almost imperceptible motion of the sensor in this way causes blurring of structured light patterns from other units which serves to eliminate most of the crosstalk." Update: It looks like University of North Carolina researchers proposed the same technique at about the same time. Business Wire: Tessera's DigitalOptics Corporation (DOC) announces today that Guangdong Oppo Mobile Telecommunications Corp. has placed the first mems|cam volume production purchase order. "We are proud to announce that OPPO and DOC are exclusive launch partners. OPPO will be the first smartphone OEM to incorporate mems|cam products in volume," stated John Thode, president of DigitalOptics Corporation. "OPPO has an excellent premium brand in China as demonstrated by the September 23 launch of the innovative N1 Smartphone platform. Integrating mems|cam modules into OPPO’s best-in-class smartphones will bring an exciting computational imaging user experience that further delivers on OPPO’s brand promise." There has been speculation on who would be the first to bring the significant benefits of mems|cam to the mobile imaging market. Last week, several technology news blogs reported that mems|cam was first being brought to market in another smartphone platform (Google Nexus 5). Those reports were inaccurate. Forbes quotes China Morning Post publishing that Oppo's total production is expected to be about 15M phones this year. Less than a year ago France-based Sofradir acquired Quantum Well-Infrared Photodetector (QWIP) and InGaAs sensor vendors. Now Sofradir and Onera announce an agreement to transfer Onera’s thermal imaging research group to Sofradir, together with a five-year project aimed at developing disruptive technologies in infrared detection in order to provide OEMs with more highly advanced capabilities in thermal imaging. "Sofradir and Onera are collaborating once again to break down the technological barriers in infrared by exploring new possibilities in optical integration and other techniques," said Philippe Bensussan, chairman and CEO of Sofradir. "Onera is known for its vision, vast knowledge and expertise in aerospace and defense system design. We are excited about leading future developments in IR detection. We have high expectations about what these advantages will bring to our customers who design optronics systems for defense, space and commercial applications." The project involves transferring emerging technologies and know-how from Onera, making them ready for industrial processing. The team will carry out research on and develop new techniques for infrared detectors, such as integrated optics, greater compactness, improved functionality and performance of thermal imaging equipment. PRNewswire: Silicon File announces its collaboration with Dual Aperture, Inc., a Silicon Valley startup, to build a new type of CMOS image sensor that can take sharp pictures, significantly reduce noise, and capture real-time distance information. Furthermore, all of this is possible while utilizing a single, low-power, small form factor sensor instead of stereoscopic sensors, a common feature of most 3D cameras in the marketplace today. 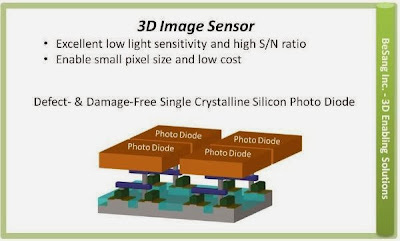 Dual Aperture's image sensor technology relies on 4-color sensor design. The 4-color sensor is comprised of RGB and IR pixels, instead of the traditional Bayer pattern. The sensor uses two separate apertures, one for the RGB spectrum and the other for the IR spectrum, to simultaneously capture two distinct images with different sharpness levels. "Dual Aperture's technology will enable new dimensions in photography with a multi-purpose camera that uses a low cost, low power, single CMOS image sensor," says Do Young Lee, CEO of Silicon File. "We are thrilled to be the first to partner with Dual Aperture in the growing market that Dual Aperture's 4-color sensor technology has created." David D. Lee, CEO of Dual Aperture also adds that "Dual Aperture is looking forward to working closely with Silicon File Technologies to develop commercial products targeted for various platforms based on our new ideas and Silicon Files' strong design capabilities. Because of its small form factor and low power usage, Dual Aperture's 4-color sensor technology can be used in a variety of consumer devices, including smart phones, tablets, PCs, TVs and automobile applications." Under the agreement, Silicon File and DA will work closely together to equip other camera OEMs with new multifunctional cameras. Silicon File will also manufacture and market 4-color sensors and camera modules integrated with new features enabled by DA algorithms. Dual Aperture apparently does not have a web site. So far USPTO published two Dual Aperture's patent applications, while WIPO lists 7 applications filed in different countries. MTG FCI Visible Detector design and development. Thanks to CV for sending me the program. Registration for the workshop is open here. Tech-On reports that Samsung Electro-Mechanics has developed a 13MP camera module for smartphones featuring optical image stabilization. The OIS can correct angular errors up to 1.5deg. This is said to be better than digital cameras on the market usually correcting 0.7deg (Actually, best digital cameras correct up to 2-2.5deg - ISW). The dimensions of the module are 10.5 x 10.5 x 5.9mm, similar the company's existing camera modules for smartphones. 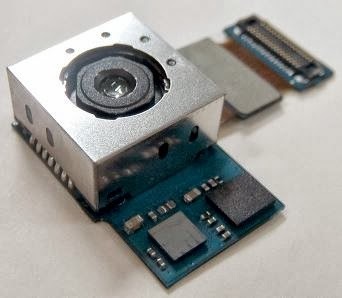 Samsung Electro-Mechanics is sampling of the camera module and negotiating with smartphone makers. The company plans to begin volume production in 1H 2014. Sharp announces a pair of CCDs with PAL and NTSC resolutions, with improved IR sensitivity. The company also registered tow trademarks "iSHCCD II" and "iSHartina". 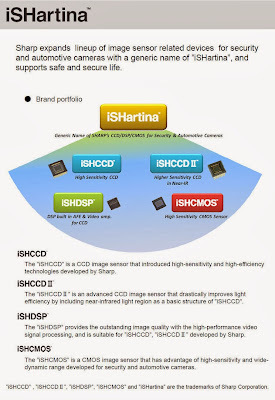 "iSHCCD II" is said to be an advanced CCD that drastically improves light efficiency by including near infrared light region in a basic structure of "iSHCCD". 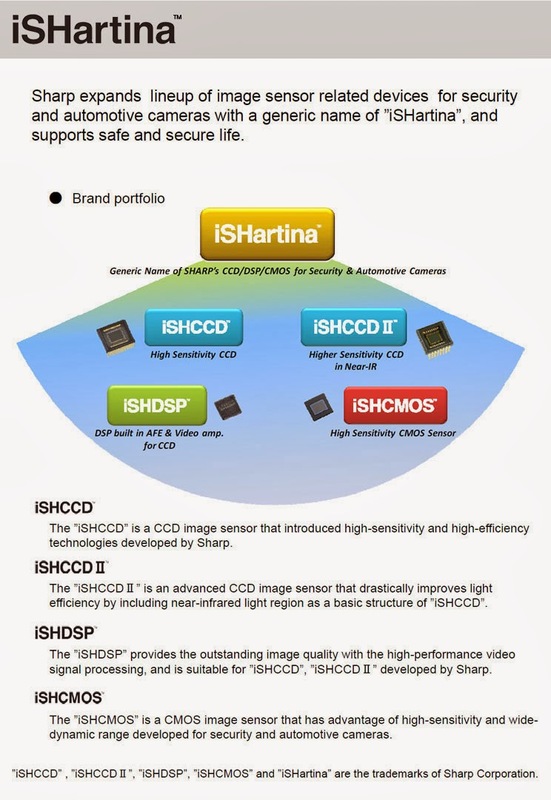 The "iSHartina" series is said to be a key device group of Sharp which realizes a next-generation sensing world. Gigaom, EETimes: Google has bought San Francisco-based gesture recognition startup Bot Square, developer of the Flutter. Flutter is an application that allows users to control media playback with simple gestures captured by their computer’s webcam. The company is said to be working on facial expression recognition to control mobile phones. There’s no word yet on financial details of the acquisition, but Flutter’s entire team of six employees, which includes four PhD’s, is said to join Google in Mountain View. Techcrunch reports that Amazon Lab126 is in the process of developing smartphone with a 3D eye-tracking interface, one at each corner of the device. The cameras will be used to track eye and head motions in order to move the interface around to ‘give the impression’ of 3D picture on screen. Another feature said to be planned for the device, but not yet locked for release, is an image recognition feature that lets users take a shot of any real-world object and match it to an Amazon product for purchase. The new phone release is not planned for this year. In consumer applications this Fujufilm's announcement would sound like from 10 years ago. But medical market is different: "Fujifilm is proud to make use of the over-megapixel customised CMOS sensor. Our experience over many years in optoelectronics and electronic imaging shows the superior quality of this technology and we can expect that our customers will see the difference instantly" says Kazuhiko Takemura, Head of European Endoscope Department, Fujifilm Europe. By adapting a CMOS image sensor, Fujifilm's 600 series endoscopes enable super-high resolution images to be produced. The leading-edge CMOS technology realizes less noise and brilliant images by converting the analog signal to digital in the tip of the scope. During transmission the digital signal is much less affected by any noise from the outside. CMOS technology also realizes 60fps progressive video. Boyd Fowler's LinkedIn page shows that he's now Technical Program Manager at Google, since Sept. 2013. The page indicates that Boyd also continues his previous job at BAE Systems as Technical Director. Boyd has joined BAE through the acquisition of Fairchild Imaging where he was CTO. Boyd Fowler is one of the directors of IISS and recently was Co-Chair of IISW 2013 and the previous workshops too. "A great benefit of the MIG sensors is that the signal can be read-out accurately multiple times (due to Non-Destructive Correlated Double Sampling, NDCDS, ability). This means that one can provide the same image with multiple different ISO values. Thus one can either choose afterwards the best ISO setting or one can use different ISO values in different parts of the image. In the latter case the ISO value in each pixel is chosen e.g. such that the ISO is increased until the exposure value of the pixel exceeds a certain limit. This has also the unforeseen advantage that the amount of bits required in the Analog to Digital Converter (ADC) can be reduced while at the same time the Dynamic Range (DR) of the image can be improved. If rolling shutter is utilized, which is typically the case in digital cameras, the reading of the signal multiple times with different ISO values bears the disadvantage that more skew is resulted in. However, in Digital Single Lens Reflex (DSLR) cameras mechanical shutter is typically used which means that the images are free of skew. 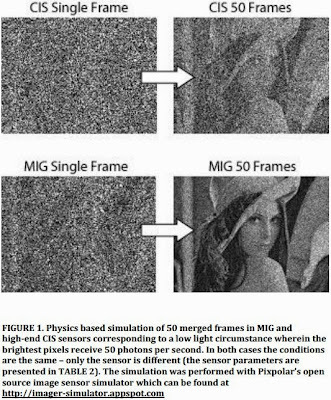 Thus the MIG sensors offer for the DLSRs (and generally for digital cameras equipped with a mechanical shutter) a unique ability to afterwards adjust the ISO settings." Eureka: National Institute of Standards and Technology (NIST) have built a prototype passive THz imaging system for detecting hidden weapons and other threats at distances up to 28m away. The technology is similar to the NIST camera in the SCUBA-2 telescope in Hawaii. Both instruments detect emissions at a wavelength of 850um, a wavelength of light that passes through both clothing and the atmosphere. Both sets of sensor arrays are packaged with superconducting amplifiers to boost signal strength, using a NIST technique that makes large arrays practical. But the new imager's sensors are made of a different metal, aluminum, which superconducts at higher temperatures of 1.2 Kelvin. This allows the sensor array to be cooled by a more compact, custom refrigerator. The NIST imager's video frame rate is currently 6fps, but NIST researchers say their system can be developed further to have four times as many sensors (for a total of 1,004), which would produce larger, near-full-body images at faster video frame rates. A short lab video demonstrating the imager will be available at NIST web site, when it opens again. Here is the older NIST presentation. Business Wire: Panasonic will be presented with a Technology and Engineering Emmy Award for 2013 by the National Academy of Television Arts & Sciences in recognition of the company’s development of In-Camera Electronic Compensation for Lateral Chromatic Aberrations in External Lenses. The trend to smaller imager formats and less-expensive optics had meant compromises in image performance without an alternative solution to this problem. The concept of modeling the aberrations of a lens and applying real-time electronic correction provides a very significant increase in image quality and permits lower cost-cameras and optics to create better images. "Panasonic is honored to receive the coveted technical Emmy for its pioneering efforts in the development of Chromatic Aberration Compensation," said Michael Bergeron, Business Development Manager, Panasonic System Communications Company of North America (PSCNA). "This technology has helped us maintain high-quality imaging while making improvements in size, weight and affordability, and now combined with master-quality AVC-ULTRA recording and native 1920 x 1080 imagers, CAC has contributed to new benchmarks for HD acquisition, getting around inherent limitations of optics." Business Wire: Daniel Van Blerkom, Forza Silicon CTO, and Ravi Subramanian, Berkeley Design Automation CEO, will jointly present a paper titled "An Efficient and Accurate Sign-Off Simulation Methodology for High-Performance CMOS Image Sensors" at the TSMC Open Innovation Platform Ecosystem Forum today in San Jose, CA. Forza Silicon uses the Analog FastSPICE (AFS) Platform from Berkeley Design Automation for circuit verification and sign-off validation of CMOS image sensors. The simulation methodology developed by Forza Silicon with the AFS Platform uses a hierarchy of models for the image sensor blocks. The complexity of the model is reduced at higher levels of the hierarchy, while still achieving maximum accuracy of the global interactions between blocks. "With the ability to tailor our model complexity for a desired simulation, we gain the advantage of rapid, accurate validation while keeping simulation time and resources manageable," said Dr. Daniel Van Blerkom.